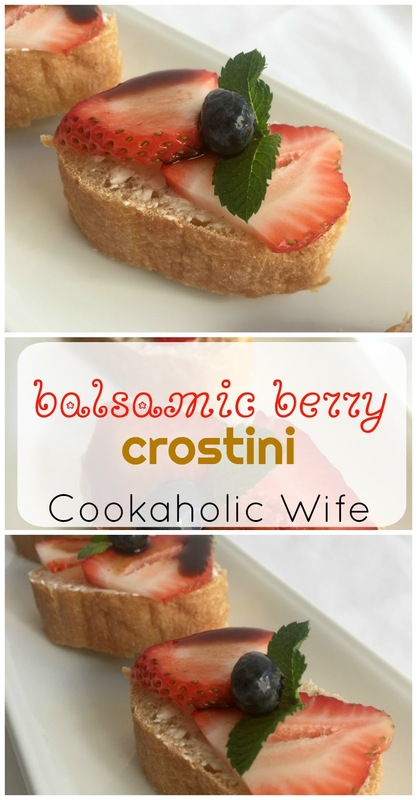 Many, many years ago I found out that putting balsamic vinegar on berries brought out their sweetness. It was something I initially would have never believed or tried, but I’m so glad that I did. 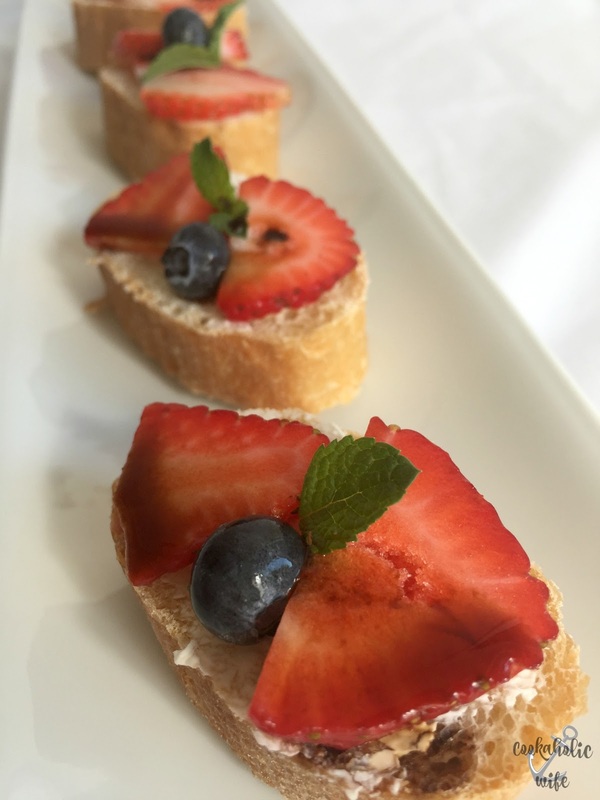 I love how the tart vinegar pairs with the sweet berries and while I don’t use the combination often, I still enjoy it from time to time. The theme for July’s Improv Cooking Challenge is balsamic and berries, which really leaves a wide variety of recipes to make. I opted to keep it pretty simple this month and use all fresh ingredients in a dish that can be whipped up quickly. No baking, no fuss and very little mess. Perfect for if you need an appetizer for a last minute party or gathering. 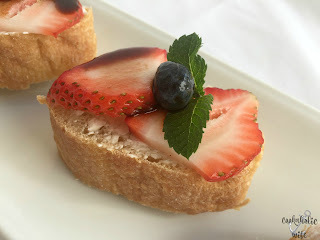 An easy appetizer made using prepared bread, cheese, berries and balsamic. 1. Preheat the oven to 350. Line a baking sheet with parchment paper. 2. Slice the french bread into rounds and place on the prepared baking sheet. Bake for 7-10 minutes or until just lightly toasted. 3. Beat together the cream cheese and sugar until combined. Spread onto the bread rounds. 4. Top with 1-2 strawberry slices, a blueberry and optional mint leaf. 5. Drizzle balsamic reduction on top. Serve immediately. *To make a balsamic reduction: Combine 1 cup balsamic vinegar with 1/4 cup honey in a saucepan and bring to a boil, then simmer until reduced to 1/3 cup. * This recipe makes more than used above. Extra can be kept in the fridge for a few days. I was running out of daylight to photograph this recipe and ended up rushing my balsamic reduction which is why it doesn’t look very pretty. It could have thickened up a lot more but I needed daylight, so I used it before it was really thick enough. Just remember to give yourself enough time! 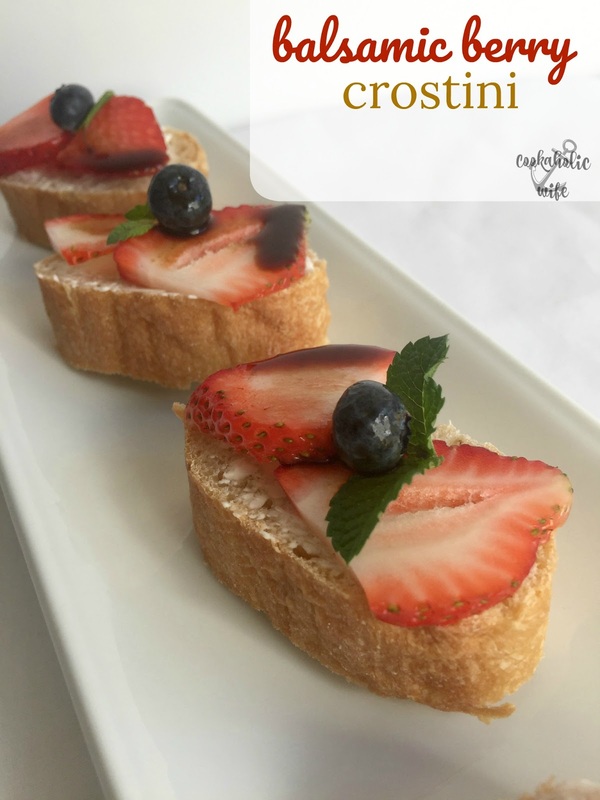 If you are a fan of goat cheese this could easily replace the cream cheese and sugar mixture that was spread onto the crostini. This is the perfect combination of light, sweet, and tart. I could easily eat a plate of these all by myself! Check out what the other Improv Cooking Challenge bloggers have made! Simple is often the best Nichole, especially when working with fresh ingredients.